The 5.6×50mm Magnum (designated as the 5,6 × 50 Mag. by the C.I.P.) is a centerfire, rimless, bottlenecked rifle cartridge that was developed in 1970 by Günter Frères of the Deutsche Waffen und Munitionsfabriken (DWM). In 1968 Günter Frères of the Deutsche Waffen und Munitionsfabriken (DWM) had developed the parent case the rimmed 5.6×50mmR Magnum (designated as the 5,6 x 50 R Mag. by the C.I.P.). According to the official C.I.P. 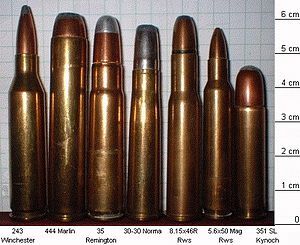 (Commission Internationale Permanente pour l'Epreuve des Armes à Feu Portatives) rulings the rimmed 5.6×50mmR Magnum can handle up to 340.00 MPa (49,313 psi) Pmax piezo pressure. That is 40.00 MPa (5,802 psi) less Pmax piezo pressure than the rimless 5.6×50mm Magnum. The 5.6×50mm Magnum and 5.6×50mmR Magnum cartridges were developed in Germany as legal hunting cartridges for small game, fox, chamois and roe deer at ranges up to and over 200 m (219 yd). In North America it is considered a varmint hunting cartridge. This cartridge occupies a useful performance niche approximately halfway between the .222 Remington and the 5.6×57mm, similar to the slightly less powerful .222 Remington Magnum and the .223 Remington. ^ a b Barnes, Frank C. (1997) . McPherson, M.L. (ed.). Cartridges of the World (8th ed.). DBI Books. pp. 347, 374. ISBN 0-87349-178-5. ^ C.I.P. TDCC datasheet 5,6 × 50 Mag. ^ C.I.P. TDCC datasheet 5,6 × 50 R Mag. ^ "RWS centerfire rifle cartridges in calibre 5,6 x 50 Magnum". Archived from the original on 2013-09-21. Retrieved 2013-09-20. This page was last edited on 26 September 2018, at 03:04 (UTC).